From the time I was born my sister and I would spend weekends with my Grandparents and we would do the coolest stuff. Grandpa drove truck and a lot of times would rest up on the weekends while Gram ran us around to movies or to see Santa (who she knew personally of course) or any other kid friendly place she could think of. My parents were not well off and my father was never around so my Grandparents always made sure my sister and I had new clothes and usually they were matching HAHA. I remember watching the Wizard of Oz, sleeping on cots and always eating popcorn, ice cream and drinking Diet Coke sometimes until I threw up! Then on Sundays we would all get ready and go to church, Grandpa was an usher and Gram taught in the Exceptionals Department for people with mental and physical disabilities. She worked at National City over at Goodyear and loved seeing her regulars she was happy back then and it showed. Then in September 1984 my baby brother was born I was ecstatic I always wanted a brother! and he was the cutest thing we ever saw he had grey eyes and rock star shaggy black hair at birth how funny was that…..we got to celebrate that night and went home with our father. The next morning we got a call that our Mother went into cardiac arrest and was in a coma we were sent to school and when we got out it was our Grandparents that picked us up. It was a month of worry and secrets, we eventually were told that our Mom would be a vegetable. Our father took that opportunity to leave us he was a coward; my Grandparents were not. My sister, brother and I moved in with our Grandparents, my Gram did all the hard paper work to make sure we had everything we needed she became our (and our Mom’s) legal guardian. I was ten years old. I thought I had the world figured out summers were spent playing all day at home or Mom would take us to Aunt Jeannie’s house where we would play and they would drink coffee and chat. In the fall I would walk to school with my friend Missy everyday and go to school and play with my friends, I was quiet…my sister wasn’t hehe. I thought I would live in that small town forever I loved it. If we weren’t home we were at Aunt Jeannie or my Grandparents. To this day 25 years later I can remember everyone I played with or went to grade school with. Then the big move. I never realized how hard it was to get all her ducks in a row, Gram just inherited a whole second family! Just when her and Grandpa should be thinking retirement and travel the world she got all of us. She took an early retirement since taking care of Mom was a full-time job and Grandpa worked 15 years longer than he had too because he had four more mouths to feed. They sacrificed everything and never once complained at least if they did it was never known to us. For the last twenty-five years they have been here for all of us through thick and thin, through good and bad choices they have always been proud of us. Gram worked hard with Mom and she is not the vegetable the doctors claimed she would be, she is mentally disabled though she has the mentality of a 5 and a half-year old. How do we know this? Her and my oldest ask the same questions, eat the same fast way, same emotions and just have the same traits. On May 9, 2010 Mother’s Day Gram passed away at 9:20 in the Emergency Room, she had been battling cancer. We were told by doctors a few weeks ago she had a year or two to live. They didn’t expect her heart to stop. It was a shock to everyone and sitting here a week later it’s still hard to believe. We have went through the planning, the calling hours, the funeral and my brother and I have even visited the grave site. And still not real. Tomorrow I have to make a million calls and get a thousand forms to help Grandpa still not real. My older sister and her family took my Mom to live with them Friday eight hours away. I talked to her tonight and she seems really good, we were all so worried but I think we are the ones not handling well not her. Grandpa and my brother are alone in the house now and Grandpa is so sad I hope his friends come to visit. I came home yesterday after a week, my Uncle left today. I called to check in and he seemed ok spoke like he was just exhausted he has cried a lot and can ‘t sleep. (neither can I) My brother and I decided we are all getting Skype so Grandpa can see everyone. I wish we would have thought of that before Gram was gone she was just getting into the computer thing even has a Facebook page. I don’t look forward to life without Gram I was there for everything; until five years ago when we moved two hours away then I talked to her every other day and got up there every other weekend at least I tried to. We had gotten to the point in our lives that we were just frank with each other. Told each other everything maybe too much (maybe not enough when it comes to her illness) but it made us very close and I will miss her so much. I feel the guilt of not being there when she died, we made plans to spend the day together I was thirty minutes away when she died. I feel the guilt of not calling her the day before; I feel the guilt of not telling her I loved her more. So much guilt, I just wish I had more time. It’s not going to be an easy year. Grandpa just wants to be with Gram, we just want him to take care of himself so we don’t lose him too. My Aunt Jeannie, my Mom, my Uncle Fred, Sister, Brother and I all lost a Mother because she raised us all. 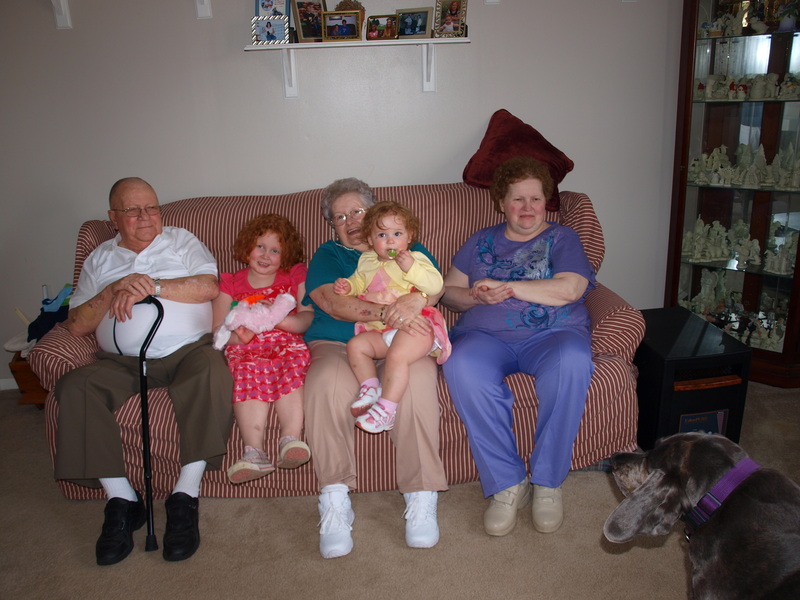 All of our children lost a Grandmother and my Grandfather lost his wife of just short of 60 years. Keep us all in your thoughts and prayers as we try to move forward without the one we went to for all the answers. I may blog a lot seems to help get it out a little and I can type through the tears. This entry was posted in Forever Loved and Never Forgotten and tagged grandmother. Bookmark the permalink. Jamie – I’m so sorry about the loss of your grandma. That has to be one of the most difficult things to ever go through, especially with a grandparent that you are so close to like you were. You’re in my thoughts and prayers. Thank you Emily, It is beyond a doubt the worst feeling I just don’t know how to act. I keep seeing the world moving on and just can;t seem to see myself normal again. Oh, Jamie. I have been wondering how you were managing over the past week. I’m so glad you are blogging–writing really does help. You and your sweet family are in my prayers! I think the Skype idea is terrific for helping your Grandpa feel connected to you all.